P.S. Want to find out how much you have learned? You will find a proper quiz with immediate feedback HERE! Qn1. A 43 year old man presents with a slowly enlarging solitary thyroid nodule. a. On gross examination, is this tumour benign or malignant? Why? b. What is the appropriate nomenclature of this tumour (eg. carcinoma, sarcoma, adenoma etc) ? a. Benign. The cut surface shows a rounded, well-circumscribed, encapsulated nodule. There is no necrosis (pale areas) or haemorrhage (dark blackish areas) to indicate rapid growth or bleeding from small newly formed vessels. There is no infiltrative growth into the surrounding thyroid parenchyma. Hence the tumour is benign. b. Nomenclature: Thyroid adenoma / Follicular adenoma (benign tumour arising from follicular cells of the thyroid gland). Q2. This is a 53 year old lady who presents with postmenopausal bleeding. The picture shows a uterus. a. Based on the gross morphology, is this a benign or malignant tumour? Why? (Try to practice describing the gross features of the specimen as well). b. What is the likely diagnosis (i.e. nomenclature of the tumour) ? Take into account the location of the tumour and likely histology. a. This is a sagittal section of the uterus and cervix. 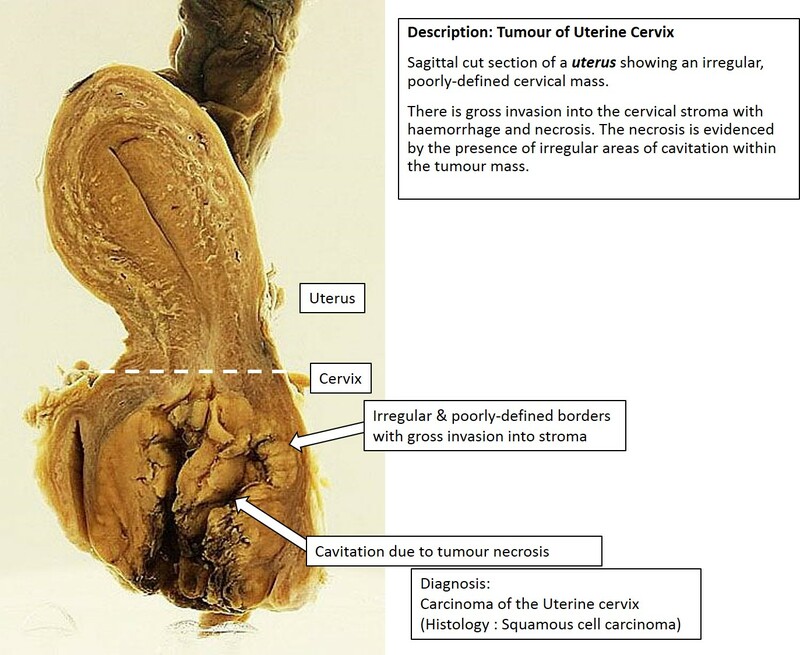 There is an irregular, pale tan mass at the uterine cervix with ill-defined margins. The mass extends upwards into lower uterine segment. The cut surface shows cavitation and haemorrhage. The features are those of a malignant tumour (infiltrative margins, necrosis, haemorrhage). Click HERE to view an annotated picture. b. Carcinoma of the cervix. Most likely squamous cell carcinoma of the cervix (ectocervix is lined by stratified squamous epithelium). Food for thought: Do you know a possible pathogenetic mechanism for SCC of the cervix? Hint: It has to do with a biological agent involved in malignant transformation. You will learn about this in the II. How (Pathogenesis) section. Q3. This is a 41 year old lady who presents with heavy menses (menorrhagia). The picture shows a hysterectomy specimen. Click above for a video description of the virtual specimen. Click on the gross picture above to enlarge it. a. This is a sagittal section of the uterus and cervix, showing a well-circumscribed, rounded nodule in the uterine wall (intramural location). It has a tan whorled cut surface. The mass has a pseudocapsule surrounding it. It does not infiltrate into the endometrium or serosa. No hemorrhage or necrosis is seen. Therefore, this is a benign tumour. b. This tumour arises from the smooth muscle tissue of the uterine wall (myometrium), and it is benign, hence it is a uterine leiomyoma. Click on the pictures below to see the MICROSCOPIC features of a benign mesenchymal tumour.